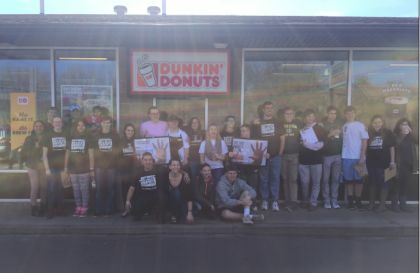 On Saturday, March 12, a group of Connecticut franchisees celebrated Guilford Dunkin’ Donuts employee Anders Carlson, an individual with Down syndrome, by participating in the national “Spread the Word to End the Word Campaign.” Anders Carlson is a 20 year-old Guilford High School graduate who is currently enrolled in the school’s vocational program. The week of March 7, Guilford High School and the town’s two middle schools collected over 2,000 signatures from faculty and students for the campaign, pledging to eliminate the derogatory use of the “R-word” from their vocabulary. This weeklong initiative culminated in an event at Dunkin’ Donuts, where Guilford High School Unified Sports teammates joined Anders to collect more signatures. 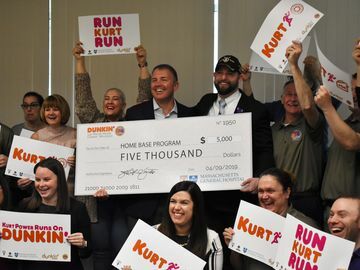 More than 300 guest signatures were collected that day and they will remain on display in the Dunkin’ Donuts restaurant at 556 Boston Post Road in Guilford. Anders Carlson works two to three days per week at Dunkin’ Donuts and is a tremendous asset to the restaurant. 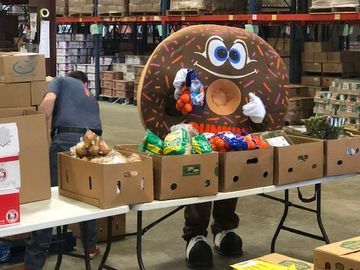 He has participated in sampling new Dunkin’ Donuts products to guests and has become a consistent face of the business to regular customers. Anders is also a favorite among the staff, many of whom also attend Guilford High School. The local Dunkin’ Donuts manager even named him “the top egg guy” in food preparation. 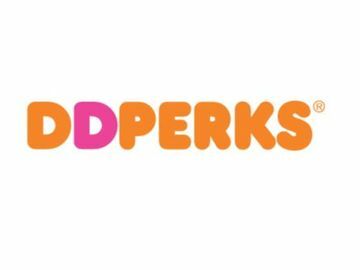 Local franchisee the D’Andrea Group own and operate the Dunkin’ Donuts restaurant at 556 Boston Post Road in Guilford where Anders had worked since Fall 2015. 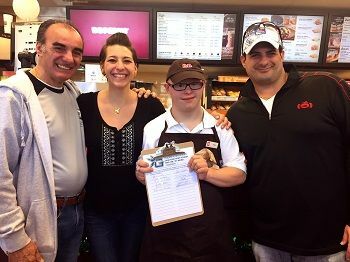 Franchisees Nicole Ball, Frank D’Andrea and Francesco D’Andrea, along with their families, are actively involved in their local community and are longtime Special Olympics supporters, volunteers and coaches. Needless to say, they were thrilled to celebrate Anders with this event. Anders Carlson will be employed by the D’Andrea Group at the culmination of his vocational program, and they couldn’t be happier to have him as part of our Connecticut Dunkin’ family. For more information about the End the R-Word campaign and to sign the online pledge, please visit http://www.r-word.org/. To learn more about local Dunkin’ Donuts initiatives in Connecticut, follow us Twitter (www.twitter.com/DDinCT)!